Ruby Meng says many companies pulled back on holiday parties during the recession, but they’re coming back now. It was clear to Erin Corriveau that the corporate holiday party was back when a past client called to book a December get-together — in April. 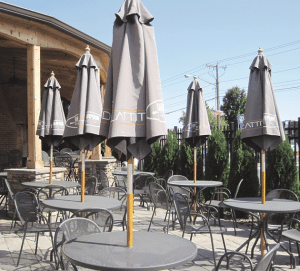 In fact, Corriveau said, Lattitude’s new banquet room — which opened last November and allowed the restaurant to handle much larger parties than before — was completely booked two months ago for every Thursday, Friday, and Saturday evening in December. 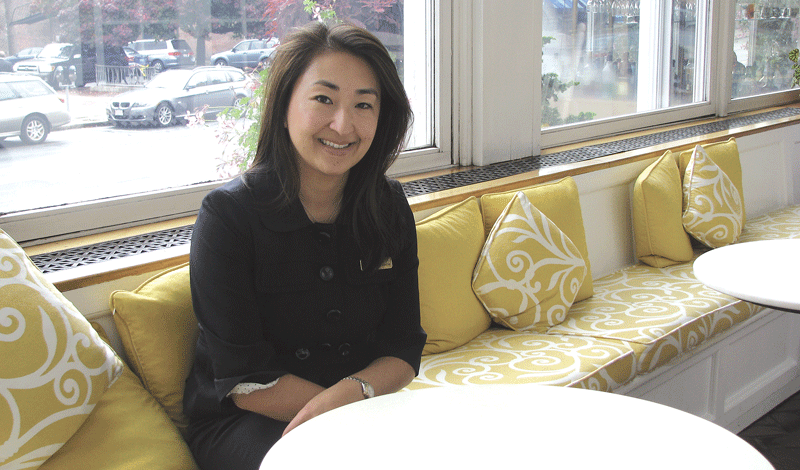 “A lot of companies have been with us for many years — well over 10 years — and they tend to book year after year,” added Ruby Meng, director of sales at the Hotel Northampton, which has also experienced robust holiday-season reservations this year. “We’re booked pretty solid on weekends, and weekdays are starting to get close. People are looking to do gatherings and holiday parties, and they’ve also inquired about holiday brunches, a little earlier in the daytime. It’s a creative way to capture more of their employees, who may be busy in the evening or on weekends. She said the industry hasn’t completely recovered from the drop in sales during the recession, simply because many companies that cut parties from the budget haven’t put them back in, even though times are better. Still, according to Jennifer Marion, assistant director of events for the Willits-Hallowell Center at Mount Holyoke College, business has picked up this year, and companies are starting to spend more money. What’s also changing is what style of party companies are seeking out. For this issue’s focus on holiday party planning, BusinessWest looks into the current trends, and why this season has so many restaurants and banquet facilities feeling merry indeed. Most area facilities are reporting a definite shift away from sit-down dinners in favor of cocktail parties, food stations, and passed hors d’ouevres, which encourage people to mingle and interact. Corriveau said it’s important to be flexible because of all the different party preferences in the business world — and at Lattitude, that flexibility extends to the site of the party. With many of these trends consistent across the industry, how do the area’s many banquet facilities set themselves apart among fierce competition? In the Lord Jeff’s case, it’s emphasizing the facility’s embrace of the holiday season and its traditions. “People gravitate toward the Lord Jeffery Inn because we’re an historic inn, and holidays have that historic tradition about it. The Lord Jeff speaks tradition,” Brown said, citing, as examples, a Sunday brunch with Santa, high tea on Saturdays, and carolers on Friday nights. She said the nostalgic holiday appeal of the facility is reflected even in its twinkling seasonal lights, which are visible from the Commons in downtown Amherst, making the Lord Jeffery Inn an attractive option for parties of all sizes. 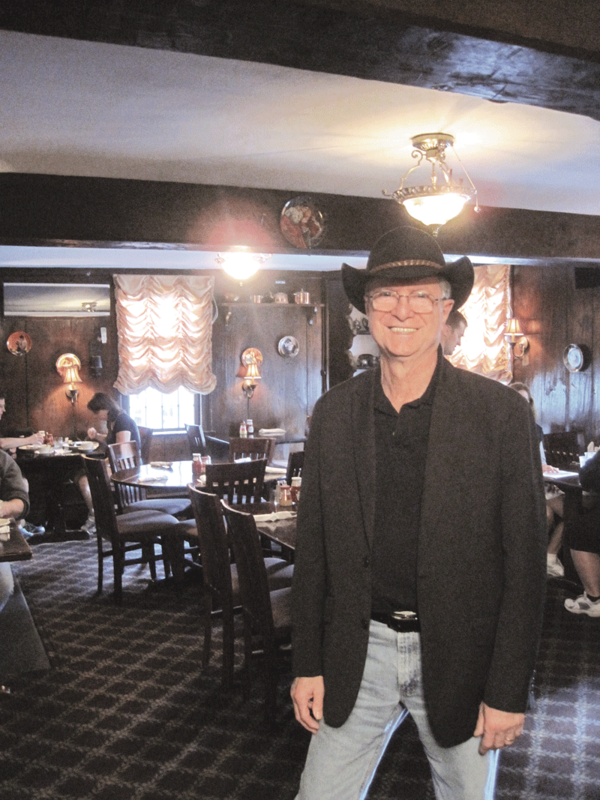 Lattitude believes its new banquet facility is fast becoming a regional tradition. The new space boasts a private bar, sandblasted brick walls, and steel beams, and is “very much a reflection of the restaurant,” she said, adding that it holds about 120 seated and up top 150 standing. Jen Marion says the Willits-Hallowell Center can provide any type of party setup, but buffets are most popular right now. Inviting is certainly a trait banquet facilities are aiming for, but so is convenience. Well, except for the actual party, that is. The season for celebrating is only beginning. David Sarrasin says he aims to meet the dietary needs of vegans, vegetarians, gluten-free diners, and guests with food allergies. People who aren’t familiar with Chicopee might be surprised to learn the city, and specifically Memorial Drive, is home to a large castle, complete with two towers and parapets that line the edge of its roof. Large lanterns on the building cast light into a parking lot with enough space for 400 vehicles, and massive doors open into a 10,000-square-foot Grand Ballroom illuminated by sparkling chandeliers and an enormous stone fireplace that burns brightly throughout every season of the year. This building, owned by the Fairview Knights of Columbus Council No. 4044, has an interesting history, said the group’s treasurer, Ronald Belair. 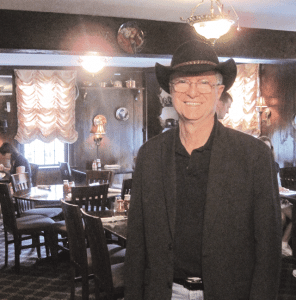 He noted that what is now known as the Castle of Knights Meeting & Banquet House, which hosts hundreds of functions each year, was once a strip mall that was home to a number of small, but well-known businesses. But over the past three decades, it has been completely transformed, and today events staged there include chamber of commerce functions, banquets, weddings, bridal showers, baby showers, 16th-birthday parties, quinceañeras, anniversaries, and church functions. It has become a tradition for many groups to hold their holiday parties there, and they are often booked a year in advance by companies and social-service agencies alike. “People come back year after year, and we also have five companies that wait until January to hold their Christmas parties,” said Sales Manager Sandi LaFleche, citing a growing trend. She added that Chicopee Savings, the Arbors, Shriners Hospital for Children, and Hulmes Transportation number among the firms that choose the Castle for their annual holiday gatherings. The Fairview Knights of Columbus established the Castle as a separate corporation 25 years ago, said Belair, and went about creating something that would be unique. In addition to this unusual setting, he stressed that the castle emphasizes attention to detail and a willingness to go the extra mile to meet client requests. For example, it’s not unusual for Executive Chef David Sarrasin to prepare gluten-free meals, along with dishes for vegans, vegetarians, and people with celiac disease at a function in which the other guests are all eating the same food. What visitors to the Castle see today is the result of a long and slow process of evolution, said Belair. It began when the Fairview K of C purchased the strip mall at 1599 Memorial Dr. 35 years ago. At that time, a large storefront, which had housed a Big Y, was vacant, but the mall contained many other tenants who had leases that had to be honored. They included Giovanni’s Pizza, Dress Barn, Ray’s Hardware, Lewis & Clark Drugstore, Ray’s Barber Shop, and Rip’s Lounge, which was a popular watering hole frequented by those stationed at nearby Westover Air Force Base. “The K of C purchased the mall to be its home — we moved from a very small facility on Montcalm Street into the space that had been occupied by Big Y, and over time we slowly renovated it to accommodate our own functions,” Belair said, noting that it was the organization’s third move, and after the former supermarket was gutted, two halls and a large kitchen were created in the space. As the leases expired for neighboring tenants, the K of C slowly took over the empty storefronts, and Lewis & Clark and Rip’s Lounge were converted into a members’ lounge and meeting facility. As more space continued to open, again due to expired leases, the K of C allowed charitable organizations, ranging from its own youth association to Boy Scout and Girl Scout troops, to use it free of charge. At that point, the K of C hall was typical of what people would expect to find at a similar organization. “It had been used for our functions, and featured a wagon-wheel chandelier and red carpeting, which were popular at the time. Although it was attractive, we needed to bring it to another level,” said Belair, adding that the Knights wanted to provide an atmosphere that could compete with other banquet facilities. Ronald Belair, with Sandi LaFleche, says the building’s castle design was intended to make it stand out. So, in addition to changing the façade of the building, an elegant interior with a more formal ambience was designed, which included large, crystal-style chandeliers. Space was also designated and used for offices, bathrooms, and storage and stock areas. Eight years ago, a second major renovation was completed, which included new carpeting, dance floors, soundproof walls, drapes, and tastefully decorated restrooms that can accommodate up to a dozen people. The Castle, which leases the space from the K of C, can accommodate groups of 40 to 700 people, and two functions can be held at the same time, thanks to soundproof room dividers. Belair said the Castle also boasts its own in-house florist, Flowers by Rebecca. “She is always available to create special items or honor special requests for weddings or wedding parties,” he said. “But our hall is decorated for every season, and we have floral displays on the walls as well as the mantel of the fireplace, which allows clients to save money if they don’t want something custom-tailored for their event. 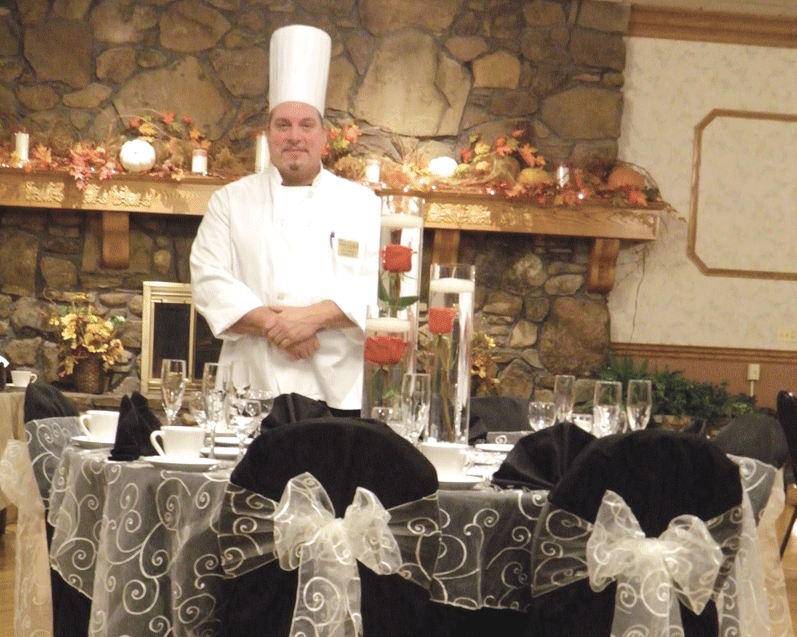 “We also have a vast array of linen colors and chair covers,” he continued, adding that a full-time sales team, banquet manager, executive chef, and four additional cooks, as well as kitchen staff, make it possible to please every guest. Sarrasin is known for his artistic creations, which include ice sculptures of swans, enormous baskets, and even a Waterford crystal egg. They take hours to complete, but an equal amount of time is spent preparing unusual international cheese platters and fruit and vegetable crudités, as well as antipastos that are up to 4 ½ feet long. The menu features a vast array of choices, although the main fare is French nouveau cuisine. “We offer buffets with carving and pasta stations as well as sit-down dinners and luncheons, with entrees that range from chicken dishes to beef Wellington, prime rib, and filet mignon, as well as our popular Castle cordon bleu and scrod,” Sarrasin said. There is also a vegetarian menu, and it is not unusual for the kitchen staff to accommodate special requests, whether it is an ethnic food or a dish normally not on the menu. Ethnic dishes that have been requested and prepared include paella, kapasta, pierogies, and galumpkis. 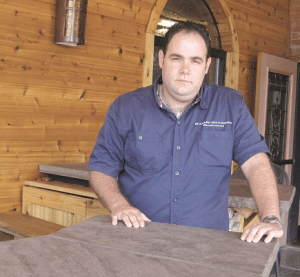 Events held there range from joyous to somber, but it is a popular setting for weddings, and LaFleche said about half of the brides who hold their wedding receptions there get married on the premises. “They often set up arches with flowers and have their guests seated in aisles or at tables,” she noted. Other affairs include beer and wine tastings as well as a variety of fund-raisers. “The South Hadley Police Assoc. holds an annual comedy night here, and the Chicopee Chamber of Commerce and Holyoke Catholic High School host a lot of functions at the Castle,” said Belair. “The FBI recently held an awards banquet here, and J. Polep Distribution stages frequent seminars in the meeting hall. Although the Castle offers many amenities, one thing that makes it different from many other area banquet facilities is that it is governed by a board of directors who are all members of Fairview Knights of Columbus Council #4044. They generously donate their time to serve on committees connected with the Castle, and the K of C uses it to host its own events, such a Valentine’s Day party and New Year’s Eve celebration, which are open to the public, along with monthly spaghetti suppers. The facility also hosts a free, annual Thanksgiving dinner that provides meals to more than 3,800 needy or lonely people, which earned it the International Family Service Award from the Supreme K of C in San Antonio, Texas last year. Overall, the venture created more than two decades ago has been heralded as a success, earning recognition and praise from businesses, social groups, and families who return time and time again. “The combination of a diversity of options, our location, and the consistent, high quality of our food are keys to the Castle,” Belair said. 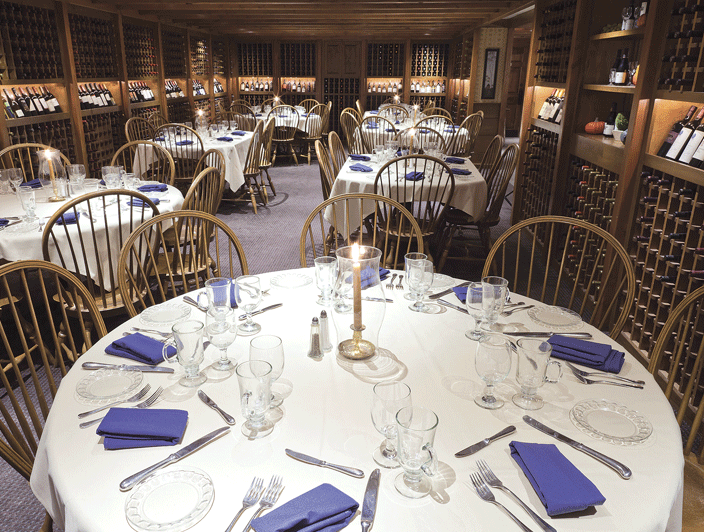 The wine-cellar room is just one of several intriguing and festive settings at Chandler’s. December is a cheerful time at Storrowton Tavern. “The entire tavern is pretty much decorated from the day after Thanksgiving,” said Vinny Calvanese, executive chef of the restaurant on the grounds of the Eastern States Exposition in West Springfield. “And we have carolers — the same people we’ve had every year since we’ve been here. They go through the entire tavern and sing, room to room, which seems to be a big hit. But, more importantly, the holiday season is an important time — not just at Storrowton, but across the dining and banquet industry, as companies of all sizes take a breather from the stresses of the year and set aside a night to celebrate with their employees. She cites a study conducted by executive search firm Battalia Winston, which reported that 91% of companies polled had a Christmas party last year, the highest percentage in the past six years, while a poll by the Society for Human Resource Management found that 72% of respondents attended a company celebration last year, up from 68% in 2011 and 61% in 2010 and 2009. For this issue and it’s focus on holiday party planning, BusinessWest checked in with several area restaurants and banquet halls to get a feel for how holiday bookings are coming along. For the most part — at least compared to the peak recession years — companies are looking to celebrate the season, and in a wide variety of ways. Bookings remains solid for December weekends, however. “Right now, we have most of our Saturdays and Sundays booked around the holidays,” she noted, adding that weekday bookings have been somewhat more discouraging. He noted that years when Christmas falls midweek (it’s a Wednesday this year) add an additional weekend to those much-desired dates, since companies tend to avoid throwing parties too close to the holiday itself. As for the type of party customers are asking for, the sky’s the limit. One of Chandler’s most prominent draws is the Christmas theming that Yankee Candle sets up year-round, but especially highlights during the actual holiday season. That includes Christmas trees in the main dining room and some of the smaller party spaces, as well as ribbons on the wall sconces and a host of other decorations. As for Chandler’s, “we also do a dinner with Santa here, where kids can come and eat with Santa. That has always been fun.” Meanwhile, “we’d like to showcase our patio this year in the evening, too, which we really haven’t been doing in the past,” she said, noting that the area is also decorated with holiday lights, while a chiminea provides some heat. A holiday party survey conducted last December by BizBash and food delivery website Seamless indicated that, as the economy slowly recovers, companies increasingly see year-end festivities as an important part of employee productivity and morale. Sounds like yet another reason to celebrate. Jeff Daigneau says creativity and hard work have helped Lattitude grow, to the point where the restaurant thrives even during the challenging Big E weeks. Jeff Daigneau doesn’t know how many times he’s told the story. But he does know that it never gets old. He was referring to what has become local culinary legend of sorts, the saga of how the most unlikely, but now the most popular, item on the menu at his restaurant, Lattitude, came to be. “I messed up during the Big E in 2008 and dropped a bunch of brussels sprouts in the frialator,” said Daigneau, owner and chef at the establishment on Memorial Avenue in West Springfield, directly across from the fairgrounds. He put what came out of the frialator on the bar for consumption — and they didn’t last long. “Now, they’re the hottest thing going — everybody’s serving them,” he told BusinessWest, adding that the vegetable that so many people love to hate has become his eatery’s signature appetizer — and an unofficial logo of sorts. Indeed, the vegetable now adorns the back of his business card and the company’s letterhead, and it will soon be on T-shirts to be worn by the staff. No one calls Lattitude the ‘house that Brussels sprouts built,’ but they might as well — it’s not much of an exaggeration. But the house was actually built by creativity, patience, and perseverance, and because all three have been exhibited in abundance, the house is getting bigger. The restaurant, which sits in the middle of what was a large, multi-tenant building that Daigneau now owns, is expanding in several directions within that complex. An outdoor patio bar featuring live music was added this summer on the west side of the property. Meanwhile, an 80-seat banquet facility will open in formerly vacant space on the east side of building in mid-November, and a new, much larger bar area, to be created in space formerly occupied by Memo’s restaurant on the west side of the building, is in the design phase. In the original restaurant, space is being reconfigured, and private meeting rooms are being expanded. The ambitious series of undertakings, highlighted by the recent installation of a new ‘Lattitude’ sign made of brushed copper, could be called a testimony to the power of fried brussels sprouts. But it’s more of an indication of how the restaurant has become a fixture only a few years after barely surviving its first fall in the shadow of the Big E (more on that later). For this issue and its focus on holiday party planning, BusinessWest looks at what Daigneau’s learned, and how he’s applied those lessons effectively enough to make Lattitude one of the region’s more intriguing business success stories. Lattitude added an outdoor patio bar this year, where patrons can enjoy live music. Retelling another story he’s related often, Daigneau said that, during his first fall on Memorial Avenue, he decided to stay open during the 17-day Big E when most all other restaurants in that area shut things down. They close because the exposition has a tendency to drain traffic from such establishments rather than create it. Many long-time patrons of those eateries also decide they’re not going to fight Big E traffic and dine elsewhere instead. Daigneau’s decision nearly put him out of business, by his calculation, but the experience provided an important lesson. Today, instead of trying to compete with, or simply survive, the Big E, he is effectively partnering with it. At least that’s the term he uses. Elaborating, he said he’s learned how to cater his menu and his entertainment to the two primary constituencies at the Big E — visitors to the show and the vendors who often arrive days before it opens and are still packing up long after it ends. The key to mastering the Big E, said Daigneau, has been a combination of offering a more relaxed atmosphere during fair weeks, especially for vendors, and offering a variety of live bands, food and drink specials, and promo nights, as an extension of what’s already going on over at the Big E.
“I’m not going to get everybody, so I put posters in the windows for events we’re going to have,” he explained. “I try to do things that would bring people in the door. This imaginative approach to navigating through late September is just one element in Daigneau’s success quotient. And it’s part of a larger operating philosophy of listening to customers and potential customers and giving them want they want — even if, in the case of those Brussels sprouts, they didn’t know they wanted it. And in recent years, what he consistently heard from patrons is that they want more — as in more space, more options, and more venues for different types of events. The elaborate renovations and new building initiatives are designed to meet all those needs. As a lessee, Daigneau had to look at the unattractive yellow stucco plaster on the outside of the building, but now the contemporary-style improvements have made the choppy architecture look like a cohesive city block, he said, which matches the elegance and creative quality of what’s happening inside. The entire east side of the building is being renovated for banquets; the bathrooms are moving to the west side, the dining room will be expanded to accommodate 120 people, and two new rooms, for up to 12 and 30 patrons, respectively, are ready, or will be, for the holidays. The small, cramped kitchen was expanded recently, and a new catering kitchen is under construction. 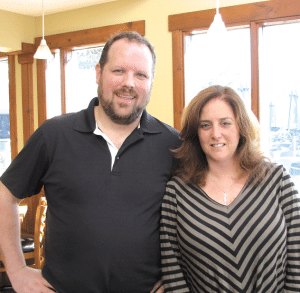 “Our off-site catering is going to explode with that new kitchen,” said Daigneau, noting that what started as a few scattered requests for Lattitude menu items has morphed into a solid business opportunity with enormous potential. The same could be said for banquet, or large-party, business, said Jamie Cardoza, Daigneau’s event specialist. “People were asking for larger venues, and we had to essentially turn business away,” she said. Plans for the rest of the building, specifically the old Memo’s area, are in the process of being designed. Daigneau said the second floor of the building will remain his office area and won’t be leased out. While Daigneau’s original plan was to do all the work at once, he ultimately opted to phase it in, a decision that, in retrospect, has worked out well because disruption has been controlled and the impact on the overall business has been minimized. And in a way, the new look and feel of Lattitude is consistent with Daigneau’s philosophy of continuously changing and reinventing to keep things fresh. Indeed, while other restaurant owners and managers are loath to remove an item from the menu, Daigneau is fearful of letting his menu get stale. One dish that has to make a seasonal appearance every year is his pumpkin ravioli with seared scallops and walnut sage cream sauce. “It’s the most popular dish we’ve ever done, and it’s one of those things I just can’t take off, and if I do, I get threatened,” he said with a sardonic smile. It’s the same look he gives his staff when he tells them what he has in mind for his popular dinner series on the third Monday of every month, an event that offers a five-course dinner, with a different cocktail paired with each course. Late last month, Daigneau served as the ‘celebrity professional judge’ for a Big E bread and dessert contest featuring creations fashioned from Fleischmann’s yeast. That assignment speaks not only to his new outlook on the Big E as partner, not competitor, but also to just how far he has come in five years — from a chef with a dream to an entrepreneur with a dining destination in the midst of exploding growth. The brussels sprouts on his business card have become a symbol of that success, and so has the new sign over his door. Actually, much better than OK.
Debra Flynn, right, and Jake Perkins say Sláinte’s party business has taken off beyond their initial expectations. Debra Flynn owns two successful restaurants and knows her way around a wide variety of food. So what does she like to order when she eats out? “My favorite food on the entire planet, when I go out, is Caesar salad and nachos. That defines a fun restaurant, and if they don’t have it, we’re not going back,” said Flynn, the owner of Eastside Grill in Northampton and part-owner, with Jake Perkins, of Sláinte in Holyoke. If those nachos — loaded with toppings and also available ‘cowboy style’ with barbecued brisket — don’t sound like something Eastside would serve, that’s intentional. Sláinte (pronounced ‘slahn-cha,’ an Irish greeting meaning ‘your good health’) opened on the site of the former Eighty Jarvis restaurant, which used to be O’Meara’s, which used to be Broadview — which is where our story begins. Flynn was in her early 20s when she first discovered Broadview on her first date with her future husband, Kevin. Perhaps because of that emotional connection, she had long had her eyes on the property, and when Eighty Jarvis closed, she felt the time was right to make a move. “We do work well together,” Perkins added. “We have slightly different styles, but they mesh well. So, what is the menu like? Favorites range from appetizers like fried pickles and cod fritters to entrees like fried chicken, lamb shank, filet mignon, with a selection of burgers, sandwiches, and salads thrown in for good measure. “Everything is made from scratch here,” Perkins said, from appetizers to desserts, salad dressings to pastrami. Besides the fresh food, Flynn and Perkins are aiming for a certain casual vibe, not unlike that of the old Broadview. “It was fun — great wings, great sandwiches … it was a great place to go, a place where everyone went in Holyoke, where everyone knew everyone,” Flynn said. Flynn said the outdoor patio and bar is “to die for,” and bands play there on Wednesday and Sunday evenings during the warmer months. But she and Perkins are equally proud of the upstairs banquet facility, which holds up to 100 people for cocktail parties and sit-down dinners. Sláinte has hosted baby showers, rehearsal dinners, and a host of other parties, including one wedding reception. The space is also ideal for breakfast meetings, and is equipped with audio-visual equipment for business functions. “We’ve had surprisingly brisk business upstairs,” Perkins said. Flynn added that her connections in Northampton and Springfield — where she was general manager of Café Manhattan and the Colony Club earlier in her career — certainly haven’t hurt. Perkins said the goal has been to create an inclusive environment that draws customers back again and again. Flynn said she’s happy with business so far. “I want to say it’s because of our quality and the service we provide and the friendly atmosphere,” she told BusinessWest. “That’s my philosophy. That’s the way you keep them coming back. She and Perkins both live within a half-mile of Sláinte, and they believe they’ve opened a restaurant and banquet hall in a city that’s clearly on the rise. Andrew Calvanese, partner with his sons Vinny and Donald at the Storrowton Tavern in West Springfield, can remember a time when the holiday party season was literally booming. 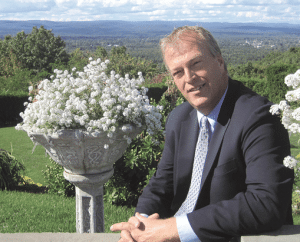 “The ’80s were just incredible,” recalled Calvanese, who was then managing Suffield Country Club, noting that money was seemingly no object, and budgets were nonexistent. To say that the times have changed would be a huge understatement. 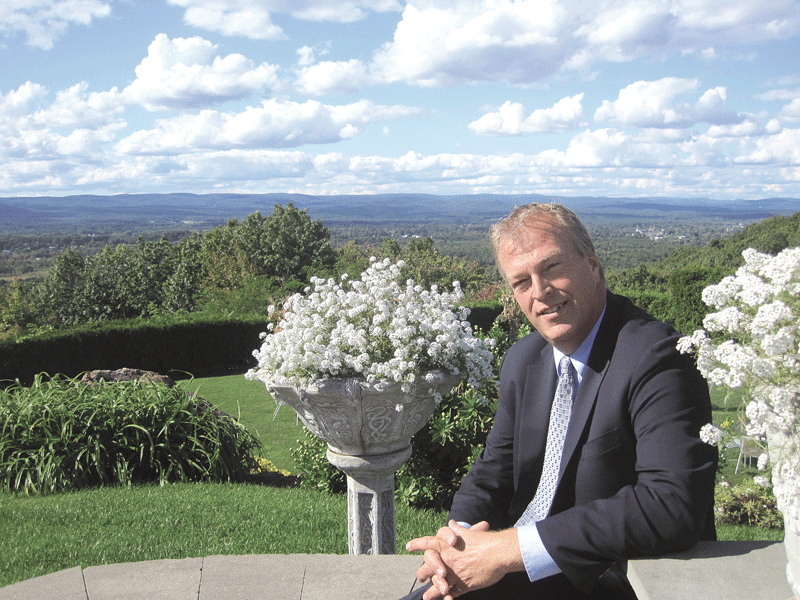 Peter Rosskothen, president and CEO of the Log Cabin and Delaney House, takes a similar outlook. He said 2008 and 2009, the height of the Great Recession, were the worst years he’s seen in terms of holiday-party spending. Things have improved a little each year since, and he’s hoping that trend will continue. Summing things up, he said he’s not wasting time pining for a return for those free-spending days in the ’80s; he’ll settle for what he called stability. Peter Rosskothen says 2008 and 2009 were bad years for holiday-party spending, but things have improved steadily since. His guarded optimism is reflected in the results from the latest annual survey of corporate America’s holiday party plans conducted by Amrop Battalia Winston, a leading global executive-search firm, which conducted the survey among a cross-section of 120 companies. 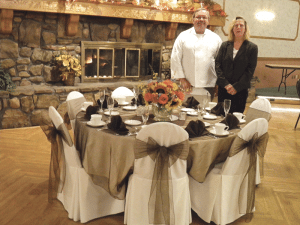 For this issue and its focus on holiday party planning, BusinessWest talked with area banquet-facility owners and managers about their expectations for the season ahead and the factors that will determine just how wonderful this time of the year will be for them. Overall, the facility managers we spoke with say they’re enjoying a steady year thus far, and, in some cases, better than steady. “Right through January, right up to now (post-Big E), to the end of the year, our banquet business is excellent,” said Andy Calvanese, noting that the family has noted consistent growth since they acquired the landmark nine years ago. Offering a total of six room options, the largest being the Carriage House for 350 and the smallest, the Tavern, seating 35, Storrowton is one of the oldest establishments in the area; portions of the buildings date back more than 200 years. Meanwhile Patrick Gottschlicht, owner of Munich Haus in Chicopee, has battled back from the Great Recession and a devastating fire in a neighboring apartment complex to record a few solid years. 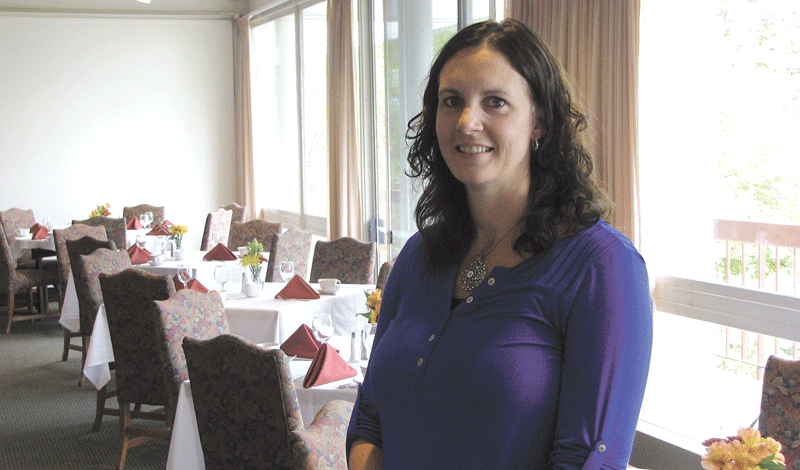 And at Tekoa Country Club, banquet manager Rachel Voci, starting from what amounted to scratch after the facility changed hands in 2009, has amassed a solid book of business. She’s built her corporate and wedding business to 98 bookings this year (not counting golf outings) in her 400-seat Berkshire Room and 200-seat Westfield Room, and with recent interior renovations, she aims to establish a new reputation, and is looking forward to improving her numbers this holiday season. But as the leaves start to turn, there is still a huge dose of uncertainty about will happen during what has historically been a very important — and lucrative — time for banquet-facility owners. Much of that uncertainty has to do with employers, their appetite for spending at a time when the economy could go either way, and the level of importance they attach to employee morale. According to the 2011 Amrop Battalia Winston survey, for more than half (53%) of all companies that were still planning on holding a get-together, employee morale was the reason. In this environment, said Voci, banquet facilities have to work with employers and become partners in staging their events, providing value for the dollar and, in some cases, some imaginative ideas on how to make the event meaningful and memorable. At the same time, the pressure is on banquet managers to help all kinds of potential customers with limited budgets — and increasingly, that means groups of employees. Envision the sales team or the IT division of a company having its own special get-together, and everyone pitches in to pay their way. Both Calvanese and Gottschlicht see the same trend and will work with budgets for even the smallest of groups. Voci added that some of those small parties will join what is now an increasingly common event, the small-group holiday get-together, which enables small companies or departments within bigger entities to enjoy the look and feel of a full ballroom. Another challenge and opportunity for banquet managers, said those we spoke with, is the need to move quickly and help those last-minute event organizers, and there are many of them. But another trend that Rosskothen would like to see more of is the use of the holiday party as morale builder and vehicle for saying ‘thank you’ to employees, many of whom have suffered in various ways because of the economic downturn. What that ‘something’ is depends on each decision maker, and that individual should put some time and attention into their work, he continued. Voci says she works with clients to brainstorm, and even the smallest touches, such as a signature drink for the night in lieu of a costly open bar, will help to personalize the event and show effort on the employer’s part. Gottschlicht will offer employers his new authentic German Biergarten, which seats 160, an addition to the 200 for the second-floor banquet hall. After the apartment-house fire next door last year that nearly consumed the Munich Haus, Gottschlicht purchased the cleared lot and created a unique Biergarten with long benches, a bandstand, and large tents and a large bar that he’s not yet sure will be year-round; he’s still working out the kinks. 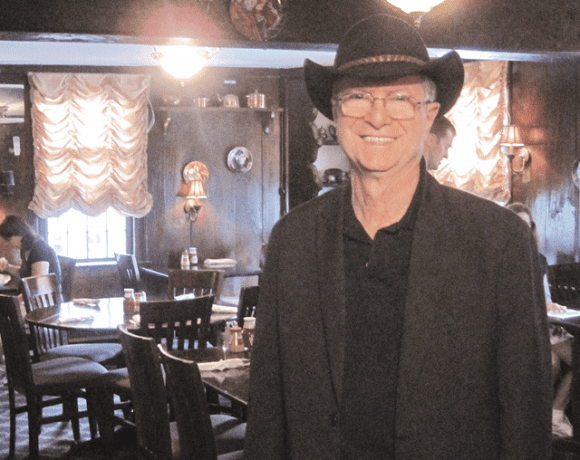 Andy Calvanese has had a successful year at Storrowton Tavern and is hopeful for more of the same come this holiday season. With the memories of the over-the-top ’80s and visions of sugarplums (sort of) dancing in their heads, owners and managers of area banquet facilities have come to the realization that times have changed, and they’re likely to be this way for the foreseeable future. In this environment, they have to create their own opportunities and make the most of them. If they can, this holiday season might become something approaching wonderful. 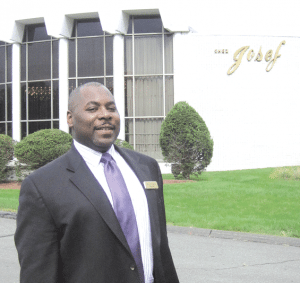 Marc Sparks has worked his way up the ladder from waiter to operations manager, and now to owner of Chez Josef. But that saying could also be refashioned to fit his new position. It would go something like this: ‘a waiter is not just a waiter; he or she could be the owner of the company someday.’ And that would fit the story of Sparks’ life perfectly. 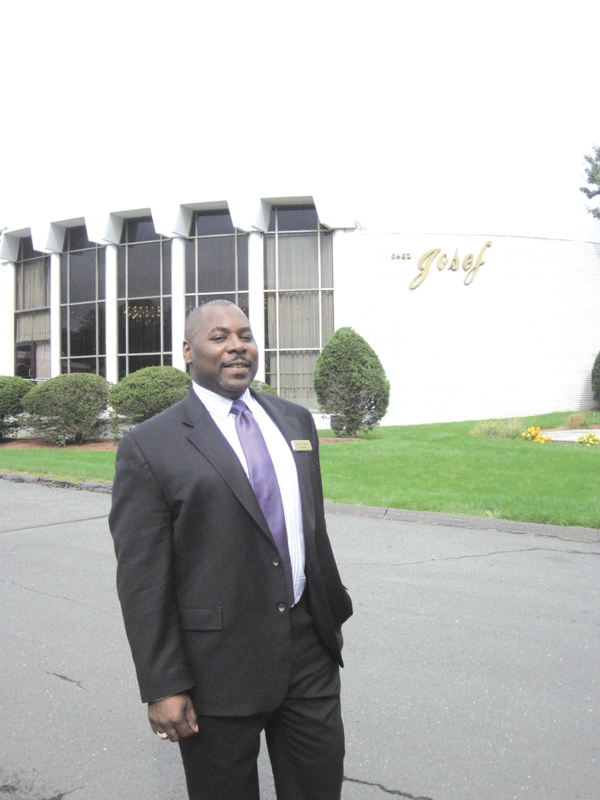 On July 2 Sparks, through his new hospitality-management company, finalized acquisition of Chez Josef from the Skole family, thus beginning a new chapter in his intriguing career in the hospitality business, one that started in 1990, when he was a waiter in the main ballroom, aptly named the ‘Allan Room’ after Allan Skole, one of three founders of the complex. His obvious pride for his place of employment for nearly two decades is matched only by his respect for the Skole family, who, starting in 1969, built and managed one of the first-of-its-kind banquet halls in the region. The banquet hall, which has been long known as a grand location for weddings, proms, gala fashion shows, and corporate events such as the Super 60 and Pynchon Awards, will soon be given an extensive facelift, said Sparks, adding quickly that, while the look may change somewhat, what won’t is the facility’s dedication to customer service — and being on the cutting edge of change in this highly competitive business. 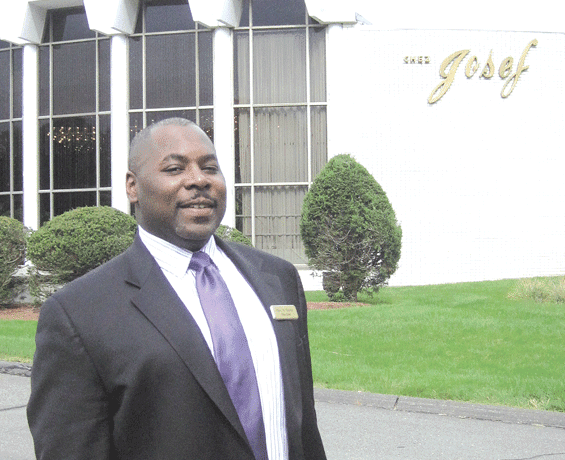 For this issue’s holiday party planner and focus on area banquet facilities, BusinessWest talked with Sparks about his entrepreneurial gambit and how he intends to make the past prologue for this Agawam landmark. In 1991, Sparks was attending UMass and working his way toward a degree in Psychology. He applied for work at Chez Josef as a bartender, but the Skoles talked him into waiting tables, and he caught the hospitality bug. He would stay with the company, taking several titles, and eventually operations manager. Throughout his tenure, he said he carried out his various duties as if he had a “vested interest” in the company, and admitted that, if the opportunity to acquire the facility ever came about, he would work to find some way to make it happen. And in 2010, those pieces starting falling into place. “I said to the Skoles, ‘if there is ever an opportunity to step in and purchase’ … and that started the ball rolling,” he explained, adding that the progression was a natural one, due to his many years there. The parties explored options together, and the result, said Sparks, was a transition as seamless as possible. And a big reason for this is the staff, he said, noting that many, like him, have modest beginnings and long tenures with Chez Josef. For instance, Executive Chef Marcel Ouimet has been with the company for 42 years, and started as a dishwasher. Anne Wright, second in charge in the kitchen, has 30 years with Chez Josef, as does Edmond Flebotte, executive assistant and purchaser. In comparison, Robin Wozniak, director of sales and marketing, is a relative newcomer, having started just five years ago. Sparks noticed something in Wozniak, who soon rose up through the ranks, just as Sparks had done, and became a trainer and supervisor. But it was a bit iffy at first, he admitted. As this experienced team takes the landmark into a new era, one of the keys to future success, said Sparks, is to change with the trends in the industry. But this is something it has always been able to do. This trendsetting began with Allan Skole in the late ’60s, when standalone banquet houses were a rarity. In fact, most get-togethers, such as proms, happened in the gym at the local high school, and wedding receptions were smaller or held at the local country club. Skole, a classically trained culinary artist, and two partners were pioneers with their concept for Chez Josef, named for one of the partners. “Even with pioneering this facility, the way that Allan designed the building is brilliant,” said Sparks, adding that the center hallway in the middle of the building that guests never see is a sound-dampening feature to keep the clatter of the kitchen from the guests. Oversized bars were also unique for that time, as were the two grand curving staircases, reminiscent of southern mansions. Sparks said he plans to continue this pattern of trendsetting. His plans are to remain on top of every new wrinkle and curve in the banquet business, and he’ll get to customers’ hearts through their stomachs. He noted that banquet cuisine is now a global experience, and the fare is a result of East meets West. But the way in which the food is served is also changing. Sparks and Wozniak both see multiple reasons for this shift from sit-down to stand-up, and number one is the ability to more readily network. Station fare also allows clients to be more creative with the menu while maximizing often-limited budgets. But keeping up with all that’s new will require due diligence. And that ‘experience’ is in a seemingly constant state of change, he went on, because that is the way things are in this industry now, as the Internet has made clients more savvy about trends and products, while technology makes this almost a 24/7 business. As a result, the pace of the hospitality industry has accelerated, and in many ways. Wozniak said Internet-educated clients are ever-more demanding, which poses both challenges and opportunities. Sparks calls this personalized process “active listening as a team,” and said that, of 20 proposals received per week, half are customized, a number that continues to rise. As the close-knit team works to build the Chez Josef of the future, a new catering arm called Chez Gourmet is being added. It will offer full-service catering, from dinner or holiday pickups and deliveries to 10-person luncheons, said Wozniak. “We’re rebranding ourselves and growing this business,” added Sparks. Also on the horizon is an extensive, multi-faceted renovation effort, with the first aspects of that initiative due to be completed next spring, said Sparks, adding that the facility plans to have one capital project going on every year. One of the other commitments Sparks has involves giving back to the community. For two full days just after the June 1, 2011 tornado struck the Greater Springfield area, Chez Josef chose to take on the task of helping to feed a few hundred people breakfast, lunch, and dinner at a local church, allowing the women who had started the process a few days to rest. And during Hurricane Irene, the staff worked with the American Red Cross to deliver food to a few of the elderly-housing units in Springfield, said Sparks, adding that assistance to area nonprofits, in the form of special pricing for fund-raising events, is ongoing. This is one of many sayings, or operational philosophies, that have guided the company for more than 40 years, he noted, while getting ready to get back to work. And they will continue to guide it through this next chapter in a storied history.